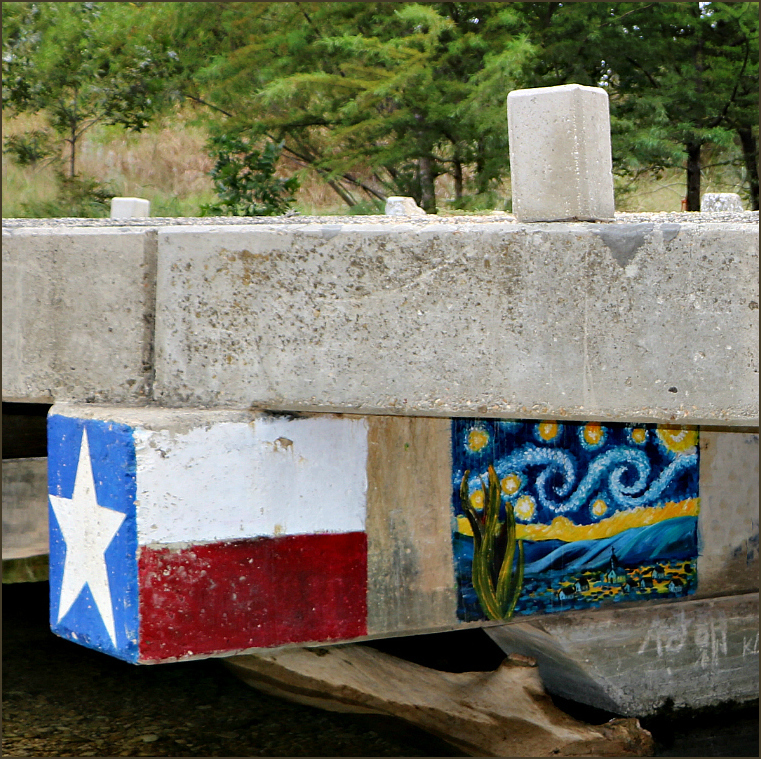 After finding a tribute to Vincent Van Gogh tucked beneath a bridge at the Medina River crossing on Texas State Highway 16, I couldn’t help wondering how long it had been there. Who painted it? How well would it survive its somewhat precarious placement only a few feet above the river? The Medina usually flows shallow at that spot, but flooding sometimes raises its waters multiple feet above the highway. I assumed that any combination of fast-moving water and debris surely would scrub the painting off the underside of the bridge, or at least damage it severely. Despite a significant flood in May of 2016, when I returned to the spot two years later, the painting remained intact, and it was an addition which caught my eye, not a subtraction. The graffiti left by a George Strait fan brought a smile for two reasons: its Texas flavor, and the care that was taken not to mar the painting. Despite the kayakers, swimmers, and casual passers-by who surely have seen this little gem underneath the bridge, it’s escaped both natural and human damage for two years. I thought of the painting recently after watching the film Loving Vincent. Searching for some historical details, I found this fascinating video which links the river and the painting through its exploration of turbulent flow. In ways that the artist who created the tribute to Van Gogh might not have appreciated, the placement of Van Gogh’s swirling skies above the Medina’s swirling waters is entirely appropriate. What a lovely hidden surprise and treasure! It certainly was a surprise the first time I saw it. I was even more surprised to find it surviving so well. I’ll be curious to see how it’s faring the next time I’m in the neighborhood. Just remind yourself that MATH stands for Many Amazing Truths Heralded. Your version’s certainly better than the one I used to imagine: that MATH stood for My Attitude? True Horror. There was a time when seeing that math reference would have sent me running, too. Thanks to sailing, I gained a bit of practical knowledge of geometry and algebra, and thanks to the great patience of one Mr. Schwartzman, I’ve come to the point of appreciating even what I don’t fully understand. McLean’s song is one that’s aged very well. I think I appreciate it more now than when it was on the radio playlists, at least partly because I know more about Van Gogh, and partly because it’s a reminder of what used to pass for popular music: a great melody with understandable lyrics. According to the Handbook of Texas, “The first European to see the river was Alonso De León, governor of Coahuila, who led his expedition across Texas in 1689 in pursuit of the French. De León noted in his diary that he named the stream for Pedro Medina, the early Spanish engineer whose navigation tables he was using in mapping his route through the wilderness with an astrolabe.” Medina must have come into use as a Spanish family name during the centuries when the Arabs controlled the Iberian Peninsula. So turbulence is a human phenomenon, too, with one group of people attacking and often conquering another as far back in history as we have records. And part of the De León heritage endures in Victoria, which was founded by Martin De León. There’s a street, an elementary school, a plaza, and a good number of people who still bear the De León name. Medina, on the other hand, has a river, a town, a county, and some orchards. I don’t remember ever meeting or hearing of someone named Medina. It occurs to me that some of the place names familiar to me from California might be Arabic in origin, like Alcatraz and Alhambra. And it seems that our the name of our sumac is rooted in the Arabic simaq . It seems that language bubbles and swirls, too. Language definitely bubbles and swirls. You’re correct that Alcatraz (‘the pelican’) and Alhambra (‘the red [bricks]’) are of Arabic origin. So is algebra. The American Heritage Dictionary traces sumac even farther back than Arabic, to Aramaic. Well, pretty cool! I liked the video. Fascinating — I know nothing much of the science of it but it’s pretty amazing how Vinnie could see and feel the turbulence and interpret it. I loved the mailbox post painting even more. Nicely done and such a fun thing for the postal carrier to see every day. I’m painting the mail box at the lake this summer. This is inspiring! Loving Vincent is on demand. I need to see it, but I bet I’ll wish I saw it on the big screen. I just love that you saw a mailbox, Jeanie. It’s another bit of proof that our mind’s creativity never ends. Our experience and our expectations both shape what we see — and when the shapes are even more abstract, there can be as many interpretations as there are viewers. I missed Loving Vincent when it was here at the Museum of Fine Arts, so I ordered the DVD. It really was a fine film. The techniques used in making it probably are the primary draw, but the plot was interesting enough to keep my attention. It started a little slowly, but after the first ten minutes or so, I was ready to keep watching. Any ideas for your lake mailbox yet? That ought to be a fun project. When I was in school, the division between art and science wasn’t absolute, but it was pretty firm. Eventually, I figured out that math and music were related, and then math and sculpture. When I got my DSLR, it took a while, but I finally started grasping the truth that math’s involved in photography, too. 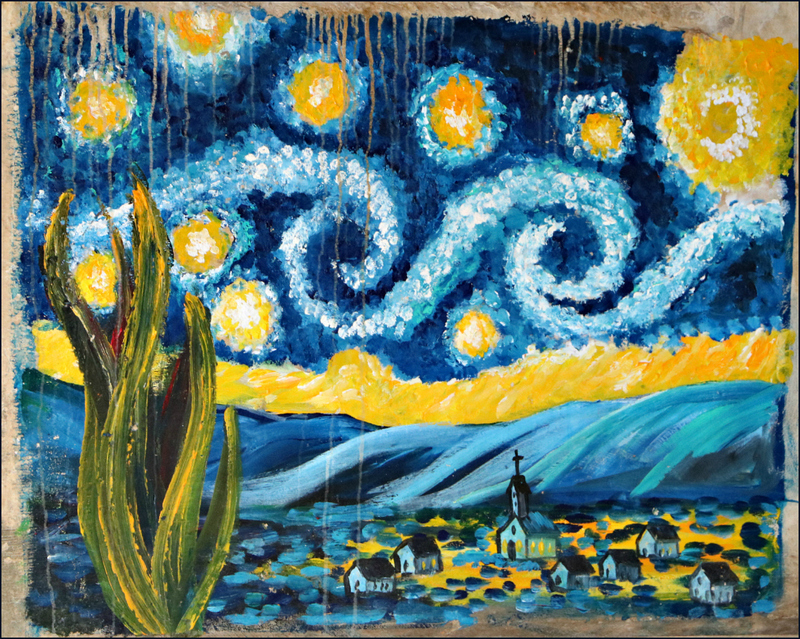 The unique perspective of the video only adds to the interest of the painting — I wonder what Van Gogh would think about the science of it all, or if he was conscious of it in some way? I remember the first time I learned about Pythagoras and harmony. It was like magic, which was, as I recall, how Pythagoras and his followers regarded it. How amazing that this painting has survived this long! Of course, we all know water erodes not because it’s strong but because of its persistence. Now I’m going to have to watch the video and see how preservation prevailed! There was a significant flood on the Medina River in May, 2015, but I’d forgotten about the 2016 flood. How the painting survived that, I don’t know. But, it did, and it’s completely delightful. I hope you enjoyed the video. I didn’t understand all of it, but it’s well enough done that even a “general audience” (that would be you and me) can grasp the basic idea. You’re certainly right about the effect of persistent water. The Texas hill country is covered in limestone rocks that have every sort of hole in them, all because of water dripping down, or percolating up. It’s going to be fun to see how long it lasts. Since it’s in such a protected spot, I’d give it a few more years, as long as we don’t have flood after flood. If I didn’t already have a blog title, that would be a good one: “Me, Discovering.” I like to say my role model’s the bear who went over the mountain. I like just roaming, to see what I can see. Why in the world, right there? Well, there are a couple of practical reasons. It’s a well protected spot, with easy access. Beyond that? Who knows? It reminds me of the day I was walking down a dock and found a beautiful, blue egret egg lying in the middle of the concrete walkway. I thought the same thing: why in the world, right there? Even better were these, left on the deck of a Grand Banks trawler. There’s just no predicting what we’re going to find out there! I liked that the George Strait fan left the painting untouched. Very respectful really. Well, yes. And a George Strait fan would be respectful, don’t you think? He’s one of my favorites. 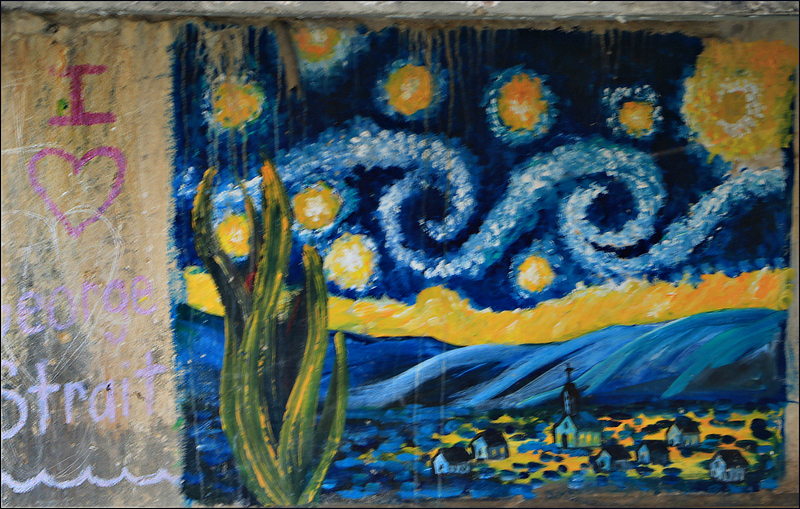 What I wonder is whether the Van Gogh and the graffiti were done by the same person, or the same group. I wouldn’t be completely surprised by that. A beautiful mystery indeed. So exciting to discover something hidden in plain sight. It was great fun to find it, Kayti, and even more delightful to find it still there. What do you think about the kind of paints that would have been used? Oils? Acrylics? It certainly wasn’t done in watercolors. Even non-artist me can figure that one out. Probably oil. So fun to find a hidden jewel. A great find! The video was interesting, thanks for sharing that! I first found the painting when a friend and I stopped at the river crossing to check out a pretty plant. It turned out to be Lindheimer’s senna, but we got far more than a nice native plant. Once I spotted the Texas star on the bridge support, the Van Gogh was only seconds away. Amazing, really. I thought the video was fascinating; I’m glad you enjoyed it. I wonder if there is someone who goes around and touches this lovely painting up to maintain its vibrancy? Perhaps a Texan art lover consumed by Vincent’s magic. I can see him rowing up to the painting in the middle of the night, torch and his little tins of paint at the ready. It seems so amazing that the colours survive the river’s elements year after year. I wondered if it had been touched up, Gerard, but I don’t think it has been. The light is different, but if you compare the two photos you can see the same streaks where water has run down from the roadway. There’s a pair of streaks that come down just to the left of the house furthest to the left, as well as those at the top of the painting. You know what they say — ars longa. For being set in such a difficult environment, this certainly has lingered. I do like your vision of the art lover. He’d have to be in a kayak, though. When the river’s running shallow, a rowboat would ground, and when it’s got enough water to float a rowboat, you couldn’t get under the bridge. Ah, the trials and tribulations of the artist! Isn’t it fun to find treasures where one least expects to find them? That painting was a true jewel, alive with energy and with mysteries of who and when and how long might it survive. long ago i painted zebra stripes on a corner stop sign post, and i confessed to the city planner that ‘somebody painted something and if somebody needs to remove it, somebody will.’ he laughed and said, ‘just don’t do any more…’ years later a friend wrote and said, ‘i can still see the stripes.. they’ve faded, but they’re still there!\ it gives her comfort, and i suspect that this van gogh painting has special meaning to some of the people who know ‘the rest of the story.’ perhaps one day you’ll uncover the rest and then share with us! I just was in the area on Sunday, and all is well. Even though there’s some road repair going on nearby, nothing seems to have changed. It really is remarkable that water and weather haven’t affected the painting, but I suspect its location offers some protection — and a lot of protection against the sort of people who would take pleasure in defacing it. You’re right that “someone” knows the whole story. I’ve been reluctant to make too many inquiries, lest I reveal its existence to the wrong people, but eventually I may find someone down at the river who does know the artist.